The title of this Saul Wisnia effort suggests that same brand of Joan of Arc-style fervor, but the title is somewhat misleading. What we have here is a fresh take on the merry band that many will always hold as curse-breakers; that is, we are getting their origin story from the truncated would-be glory days of the 2003 season, and even back to the reign of general manager Dan Duquette during the Nomar Garciaparra and Mo Vaughn era. Ortiz teddy bears whilst reading along, for everyone else this will likely prove fascinating stuff. Ironically, when we get to the “time to slay the Yankees with the most epic of epic comebacks” bit, there’s really not much need to keep going. You know that story. You’re not going to have it greatly enhanced here, unless you count the realization or reminder that Ellis Burks, from way back in the Joe Morgan era, was actually on this team, and that he’s a go-to source for Wisnia. But that 2003 crew — an absolutely loaded wagon of a team — is given the analysis and context they’ve always deserved. Wisnia argues that this may have been the most accomplished offensive team in baseball history. But as important, they were a unit that possessed the ability to fight back after getting knocked down. Red Sox teams — and remember, core groups used to stay together a lot longer than they do now — were never much good at this. In the end that attribute became a major factor in 2004, a season marked by a long gestation period. One of the key subplots involves Nomar’s exodus and how all of that shook out. Wisnia makes a point of reminding everyone just what the shortstop meant not only to Boston baseball culture, but also the city as a whole. And yet, I cannot think of a career .313 hitter who as quickly went from being the city’s most popular athlete — even Pedro wasn’t as big as Nomar when the latter was healthy — to being an afterthought. 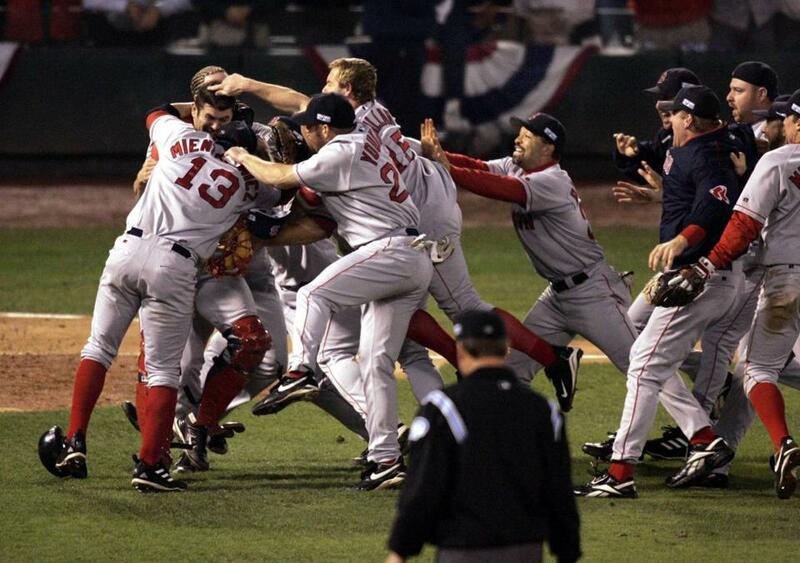 But the ’04 Red Sox were like that in that everything that came before, everything that did not factor into the final goal, was swept away like so much detritus by a surging sea. If prose had a flavor, the bulk of it here would be straight-up vanilla. On the trade of A-Rod to the Yankees: “The deal was met with groans throughout Red Sox Nation.” But then this is not a book readers awaited to partake of flights of voice and style. This is a fair book, not a rah-rah thing, and while it’s clearly written by a fan, it’s balanced. The more rewarding course — and perhaps someone else will take this up — would be to look at those pre-championship years in greater detail, as they seem to be the real story here. But hey, this is a start. And given that Wisnia’s intention is probably not to get you to don your Red Sox footie pajamas as you relive those punch-the-air times, you’d have to score this a hit rather than an error in Red Sox baseball-book matters.